Rise in gold prices in national and international market has forced the people to buy artificial jewellery even for brides and preference of jewellery-loving women is to buy imitation jewellery. Women now show much less interest in silver or gold jewellery and rush to buy artificial jewellery. Goldsmiths also admit that new trends in gold prices have changed the whole scenario for people. The owner of a gold shop at Aabpara Market said, “Artificial jewellery has become more attractive for women, and the unprecedented hike in the prices of gold has declined the customers’ purchasing power and is keeping them at bay”. He said, in the past when price of gold was much low, people bought gold for long-term investment, but now trend is changing. Now preference of the people is to buy imitation jewellery, which is much cheap and designs are also fabulous. The imitation jewellery business has now turned into an industry and millions of people are directly or indirectly related to it. With the increasing trend in artificial jewellery, its prices have now increased in the current year as compared to last year. 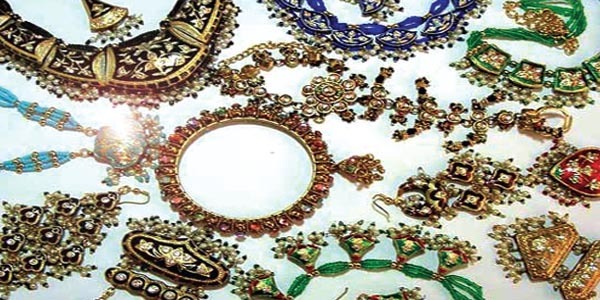 A good quality set of the artificial jewellery which was available at Rs 2,000 to Rs 3,000 six months ago is now available for Rs 5,000 to Rs 6,000. Now the Chinese jewellery has also set a good impression in the local market and women prefer to buy it due to good quality and design as well as less price. i am very fond of jewelleries. What’s up, after reading this awesome paragraph i am also delighted to share my experience here with friends.